While I was doing my Child Life internship, I did my first rotation in oncology. One of the first patients I met had a brain tumor in its advanced stages, and it was quickly beginning to eliminate his motor skills one by one. By the time I had the privilege of meeting him he had already lost his ability to walk and, among other things, he was beginning to lose his ability to communicate verbally. As you can imagine this was extremely frustrating for him as well as for his care takers. Try to picture what it would be like to have needs that you once had no problem meeting on your own that you now had to not only rely on others to do for you but you also could not effectively communicate what it is you may need. All of the frustration from that on top of all of the other frustrations that a child has to endure when they are diagnosed with a critical illness. So, naturally, my goal as his child life specialist was to do WHATEVER I could possibly do to make his situation a little less stressful for both him and his family. After speaking with the family on a few different occasions I began to realize that communication seemed to be the biggest stressor within their day to day lives. The lack of effective communication would often lead to much bigger issues, and so it was clear that something needed to be done right away to help bridge this gap. I immediately started trying to solve this problem and recalled something I learned about in one of my special education classes. In this particular class we learned about the various technologies and tools educators would use to help children with disabilities communicate and learn. One of the more simple technologies was picture boards. These picture boards would be a way for non-verbal children to express a need, feeling or desire. They were also a tool for learning. 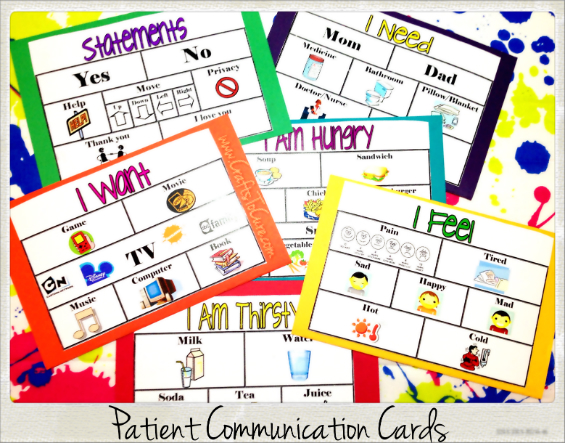 My first step was to gather all of the information I had about this patient and write down the things I knew were the most frustrating for him to try and communicate. I decided on a few different conversational categories and then made a list of common words or phrases that related to each demand or expression. 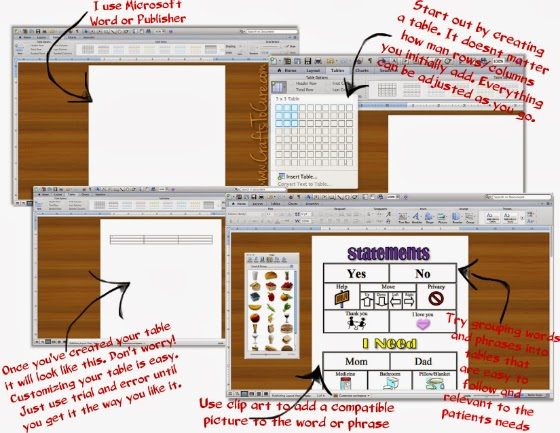 Once I had a pretty good idea of what words and phrases to use I then turned to my computer and tried to plan out an easy yet organized way in which to create a communication table. I decided to use Microsoft publisher because I was the most familiar with it. 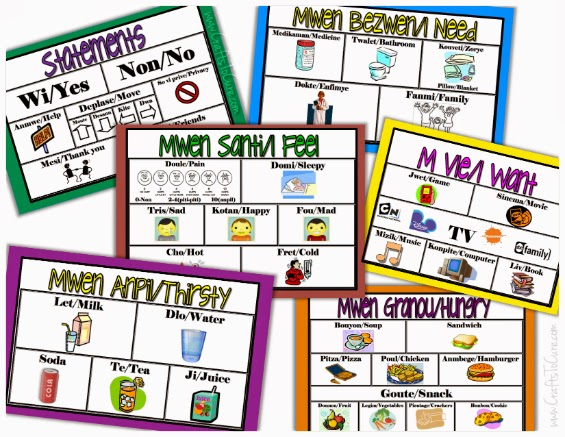 I created a table for each category and then began placing the words and phrases on each one. I then decided to use clip art to help make it even easier to follow and understand. After setting up the tables the way I wanted I had to decide what would be the best way for them the be put together. I ultimately decided on making each table stand alone which meant they would be easy to focus on and also easier to carry around. I kept it simple and just put each table on a different sheet of colored card-stock and then decided to bind them all together with a small ring. 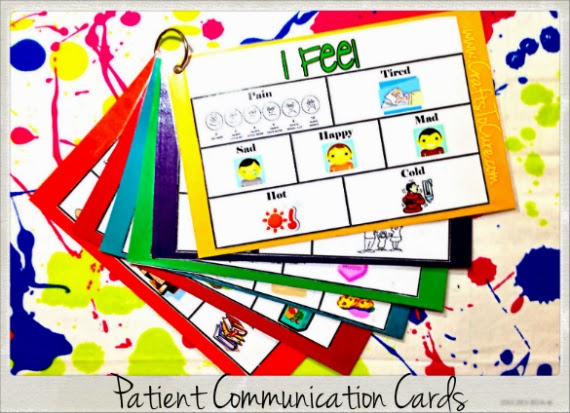 Once the initial cards were made I took them to my patients room and showed them to his family hoping to get a little feed back on other words or phrases they felt would be helpful to have on the cards. However, the reaction I got from his family was one that I had not anticipated and it is most certainly one that I will never forget. As soon as I showed the patients mother what I had made she burst into tears and hugged me in one of the most unforgivable embraces of my life. She was not only grateful but she was so so relieved to have some hope for communicating with her son again. After the initial emotion settled down we then started to discuss ways in which I could make them even more specific to the needs and interests of the patient. Because I saved everything I had done on my computer I was able to quickly make adjustments and changes to the tables so that they were attainable to the patient and his family ASAP. Saving those tables proved to come in handy yet again a few weeks later. Child life was called when there seemed to be an issue communicating in the PICU. Once a CLS was on the scene they discovered that the patient was a child from Haiti that had serious health issues and was brought to the USA by a couple that had been there doing missionary work. The child was apparently in some sort of turmoil and he could not communicate to the staff what it was he needed. Due to the fact that he was in PICU the family that brought him there was only permitted at the regular visiting hours, and therefore they could not be there to translate all the time. 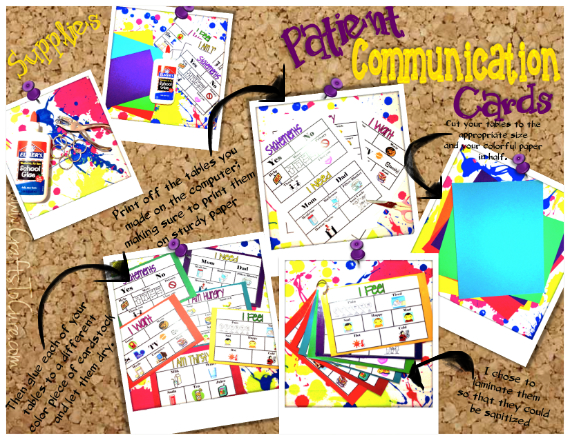 The staff in PICU were hopeful that child life would have a solution and fortunately the CLS on the scene remembered the communication cards I had made for my oncology patient. She came to me with the scenario and asked if there was any way for me to make the same kind of cards with translations in both English and Haitian-Creole. I of course wanted to help and so immediately started looking up the Haitian translations of the words already on the cards, and adjusted some of the words and phrases to better suit this particular patients needs. It was a simple solution and one that reaped great benefits! Wishing everyone happy hearts and bright ideas to make these dreary winter days sparkle and shine!